Who are you when everything is stripped away? Who do you become when your possessions, family, and dignity have disappeared and you are left bare? The future can seem impossible when you start with nothing. 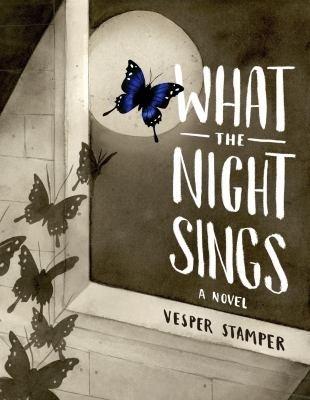 In What the Night Sings, Gerta has endured two long years in a German concentration camp. Surviving with her is the hint of a song and her dream to sing. In front of her is her heritage, a people she doesn’t know and overwhelming decisions about who she is to become. Gerta didn’t even know she was Jewish and now that empty part of her past makes moving forward even more difficult. Gerta befriends Lev, a traditional Jewish man who represents Gerta’s personal struggle to shed the traditions of a people and follow her dreams, to be free of others’ rules and sanctions for her. Can her personal dreams survive a Holocaust and thousand year old customs? Will it become another prison? Music has sustained through all the horrors. Will it be part of her future? Stamper embeds ink wash illustrations within the text. In the Author’s Note she describes how she took some direction from “slow cinema” to tell her story, using elements from directors like Tarkovsky and Tarr to create haunting pieces of art. These gorgeous additions add to the already powerful story. Her use of language and the role of music in Gerta’s life makes this story stand out in a sea of Holocaust books. This entry was posted in Reviews and tagged Catherine, Older Teen Fiction, The Holocaust on April 13, 2019 by Tony. 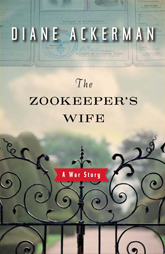 The Zookeeper’s Wife by Diane Ackerman is a work of non-fiction that centers on the lives of the Zabinskis’ in World War II. They owned a zoo in Warsaw prior to the war and used this zoo during the war to hide Jewish people. This book originally was brought to my attention when it was mentioned during a documentary about Lutz Heck and his attempt to create perfect animal species with money from famous Nazi leader, Hermann Göring. The story is mostly is a retelling of Antonina Zabinski’s personal diary from before and during the war. The family’s history and life before the war is introduced in the beginning of the book and tells of how they became owners of the Warsaw Zoo. 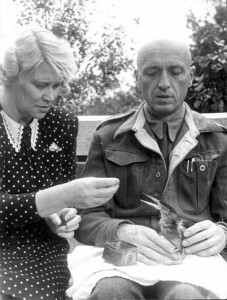 They were both passionate about animals and rehabilitated many within the zoo. Eventually the war reaches their doorstep and wreaks havoc within the zoo walls. Animals are quickly slaughtered or let loose to roam the streets of Warsaw. The zoo is taken over by many people after the beginning of the war and also takes on many different faces including a farm for pigs at one point. Antonina and her husband Jan both held the ideal that Nazi racism was “inexplicable, devilish, and a disgust to the soul.” Even though his father was a staunch atheist, Jan had grown up in a mostly Jewish neighborhood and held a high regard for the Jewish people. In the summer of 1940, the Zabinskis’ made the decision to become a part of the Resistance to provide safe hiding places for Jews within the zoo. Even though German soldiers frequented the zoo for a place of solitude, they regarded the Slavs as a highly stupid race that was only fit for physical labor so they never expected them to hiding Jewish people in the tunnels of the zoo. To allow the “guests” to remain undercover, the refugees were given animal names and the animals were given human names to confuse anyone that may have been visiting the zoo. The zoo took in several families during the following years and saved them from either a life of hard labor or death in the concentration camps. This story was an intriguing read and was certainly a different viewpoint of World War II. We often hear about the astounding numbers of deaths of humans in World War II, but not about the number of animals in zoos or homes that were lost. The Zabinskis’ story is one of heroism, humanity and resilience in a war torn country. Without them, many more Jews would have been slaughtered by the Nazi’s. Ackerman, a naturalist by trade, does a decent job portraying the facts and little more. Many reviewers have noted that she does mistake some of her numbers within her research, but the casual reader will probably never notice this while reading this book. I would recommend this book to any history lover and especially those who enjoy tales of true humanity during World War II. This book is set to become a movie starring Jessica Chastain sometime in 2016. EDITOR’S NOTE: The Warsaw Zoo opened a permanent exhibit honoring the Zabinskis this year on April 11, 2015. This entry was posted in Reviews and tagged Adult Non-Fiction, Sara, The Holocaust, World War II, Zoos on December 15, 2015 by sarahuesman.